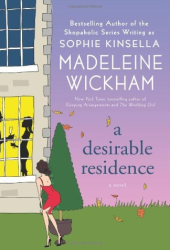 A Desirable Residence was originally published in 1996, the second novel by Wickham (AKA Sophie Kinsella ). It's easy to see why Wickham's novels have bloomed over the years into the successful Shopaholic series under the Kinsella moniker; as this particular novel really reads more like a debut or starter. Although A Desirable Residence is a quick read, it just isn't as satisfying as I had originally hoped it would be. The book centers around three main families: the Chambers', the Witherstones, and the Prentices. The Chambers' family is comprised of Liz, Jonathan, and their teenage daughter Alice. While the adults deal with two mortgages, debt, and running a newly acquired tutorial school, Alice finds herself trying to fit in with the grown-ups in the Prentice household. Ginny Prentice is a PR and Piers is an almost-famous actor who move into Alice's old house. Lastly, the Witherstones are comprised of businessman and broker Marcus, spindly and irritable wife Anthea, and their two brilliant sons, Daniel and Andrew. Marcus and Liz fall into a whirlwind affair while Jonathan is dedicated to tutoring young Daniel to help generate a boom in business. As you can see, all the characters intertwine into a big ball of messy mayhem that just gets worse until it implodes at the end. A Desirable Residence is very dark and full of black-humor. The characters are depressed, nasty, weary, and wayward at a minimum, and I didn't find myself sympathizing with any of them! In the midst of reading this novel I finally came to realize and accept that all these characters are simply pathetic; then I was able to enjoy the novel for what it was -- a train-wreck only slightly entertaining. My favorite character in the end was Jonathan. Within the last few pages of the book, Jonathan subtly lets on that he was one-hundred percent aware with all that was going on with everyone throughout A Desirable Residence, which isn't surprising given his intellect . I think this factor alone made the novel more likable upon finishing it. If only we had been made privy to Jonathan's acute ways earlier on! Although I'll be treading cautiously on other novels by Wickham, I remain a dedicated, hard-core fan of Sophie Kinsella nevertheless. Sophie Kinsella novels are to Madeleine Wickham novels just as Janet Evanovich 's stellar Stephanie Plum series is to her early-on quickie romances written in the late 1980s-early 1990s, which simply aren't that great. Other Madeleine Wickham novels include The Wedding Girl (1999), Cocktails for Three (2000), and Sleeping Arrangements (2001).